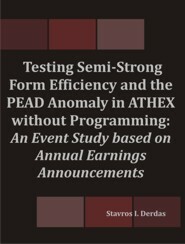 Semi-strong form efficiency is generally supported by event studies, especially these on daily returns testing the market's reaction to accounting earnings. Nevertheless, the Post-Earnings-Announcement Drift (PEAD) anomaly, being inconsistent with semi-strong form efficiency, seems to have survived robustness tests through the years. This paper examines the reaction of ATHEX in response to fiscal year 2006 annual earnings announcements of 20 high capitalisation companies. The common event study methodology is being used in order to define expected returns and trace the abnormal performance of these stocks. Three portfolios are constructed based on the unexpected component of the reported earnings per share (EPS). The abnormal performance of each portfolio over time is identified by the daily Cumulative Average Abnormal Returns (CAAR). The results of this research reveal that ATHEX gradually reacts prior to the earnings announcements, resulting in weak price adjustment on the announcement day. The limited presence of the PEAD anomaly is not considered to be very statistically significant. The outcome of this research is that ATHEX should be considered as near efficient during that period, bearing in mind that it fairly succeeds in revising its estimates so as to prohibit the emergence of exploitable inefficiencies.